October 1st was a special day in Napoleon, North Dakota, as the local Lions Club celebrated its 85th birthday with a supper and program at the Downtowner Bar & Grill. The Napoleon Lions Club officially was chartered on November 12, 1929, but local organizers decided that having their birthday celebration before the weather changed for the worse (which was the case the last time the Napoleon Lions celebrated when the club turned 70 and then Lions President Bill Biggs was detained in Napoleon during an early winter storm). 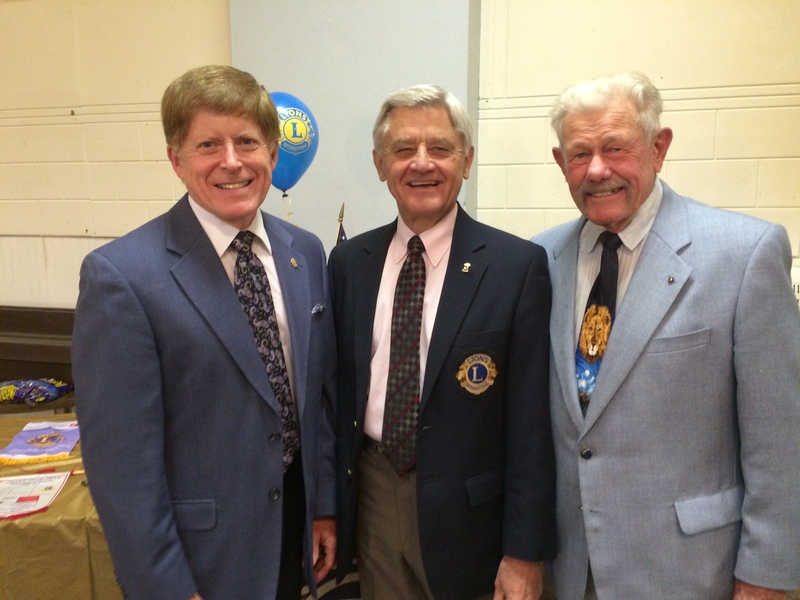 The event on October 1st was special for another reason: the three Lions who have served or are currently serving as an International Director were present to honor and celebrate the history of the Napoleon Lions Club. I was grateful to be present with Past International Director Bruce Schwartz (center) who served on the Board from 2002-2004 and Past International Director Bill Gackle who served from 1981-1983. PID Bruce lives in Bismarck, with his wife, Julie; while PID Bill resides in Kulm, with his wife, Marilyn. Prior to our arrival in Napoleon, we didn’t know that all three of us would be present, but the significance of us being there together was something we all recognized and appreciated. 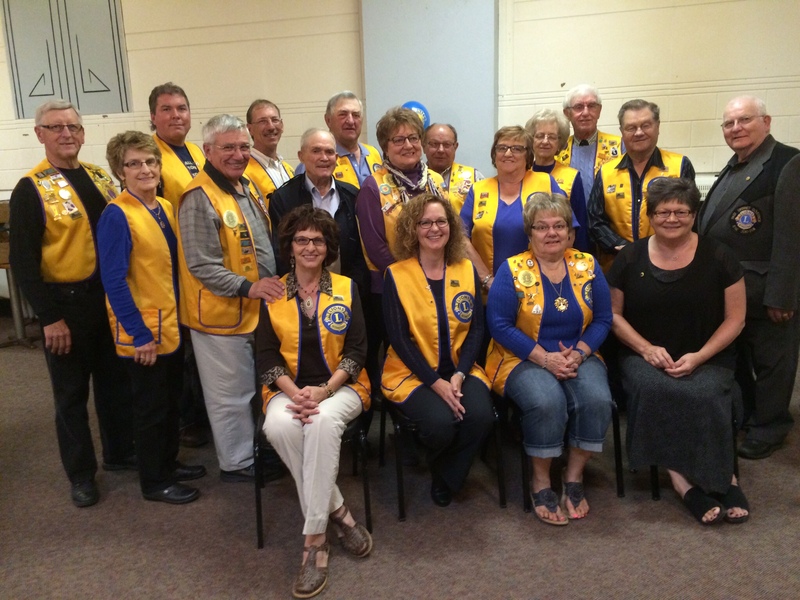 Members of the Napoleon Lions Club were great hosts and took time to pose for a group photo following the dinner. Lion Jerome Schwartzenberger was the emcee for the evening. 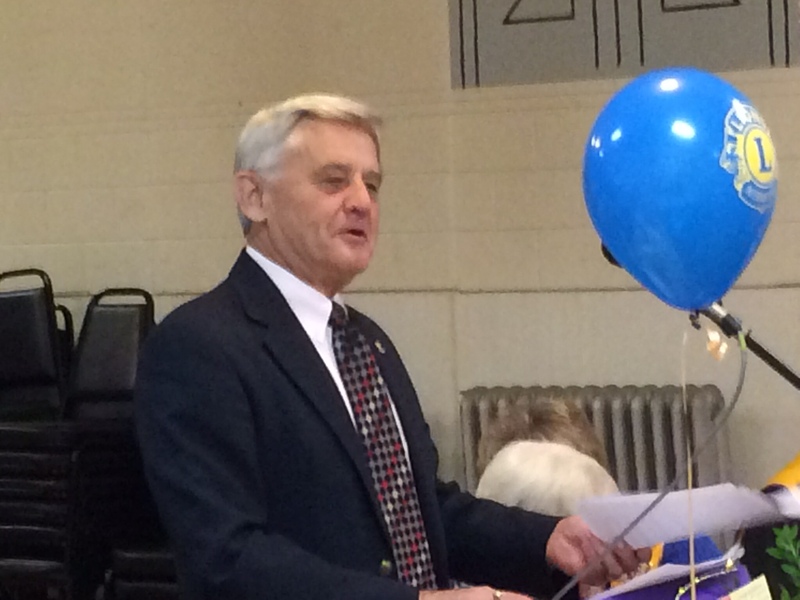 He shared some of the history of the Napoleon Lions Club. The original members totalled 20 and eight more joined during the first month. Some of their accomplishments include: purchase of the city park, taking a leading part in building the Exhibit Hall, sponsoring town bands, Boy Scout troops, basketball tournaments, music events, and bringing in fine entertainment. The club was instrumental in getting a reading magnifier for the Napoleon Care Center, getting a medical clinic built, assisted in getting a toll free telephone exchange between Napoleon and Wishek, getting a road constructed and paved to Beaver Lake State Park, getting Highway 34 east of Highway 30 paved, and many other important contributions that have made a difference in the history of the community. Emma and Sophie Ketterling sang the national anthem with their angelic voices rising to the highest notes with ease. Justin Hoberg, a senior at Napoleon High School sang several selections with a voice that some said reminded them of Johnny Cash. The guest speaker for the evening was PID Bruce Schwartz who entertained and inspired the audience. Following his remarks, several gifts and presentations were made to the club, including a special wall plaque for the club to use in the lobby of the restaurant where they hold their regular meetings. 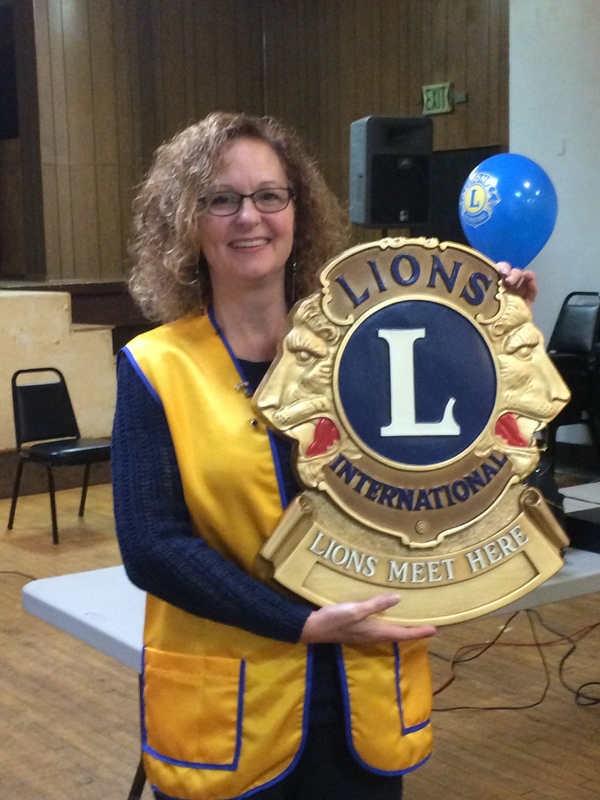 Lion Athena Dunn, president of the club, received the gift from Past District Governor James Ruff. He and his wife, Lion Donna, are members of the Napoleon Club and have been Lion leaders in south central North Dakota for many years. Ruff. These Lions make such a big difference in their clubs and help to keep members excited and focused on serving and giving of themselves to others. I thoroughly enjoyed my participation in the celebration and had an opportunity to thank the Lions of Napoleon, Wishek, and Lehr for being at the MD5 convention last May and supporting my endorsement to run for the position of International Director. As we enter the month of October, our schedule is picking up speed. Kathy and I are preparing to leave this weekend for the October Board Meeting in Scottsdale, Arizona. There are many items on the agenda that are important to the Lions of North America and the World. I have read all of the advance reports and am ready to participate in the discussions that lie ahead. I will be reporting on our decisions and seeking your feedback. Then, we’re off to the North Dakota State Lions Convention in Jamestown! ID Mike Molenda and his wife Linda will be our international guests. We are especially excited because they are our mentor couple on the Board and we plan to give them a great North Dakota welcome! It’s great to be a Lion! Strengthen the pride in your club and activities as you support vision projects during the month of October!